Here is the home for my top 30 rankings. I can’t believe we traded highly touted prospects like Outman and Cardenas for Joe Blanton. He’s a solid innings-eater, but Outman and Cardenas are ranked here in our top ten! Just because you don’t get hurt doesn’t make you an innings eater. After 45 pitches Blanton’s stats soar. He is a five inning guy if he can get past the first. But you do have a ratings point. Anyway Blanton will soon be a Yankee and farm system will get better. Are you serious? Joe Blanton was incredible for us down the stretch and was a big part in helping our team win the World Series… you’re upset that we lost Josh Outman and Adrian Cardenas?? Really? Those guys wouldn’t even be on our 25 man roster and aren’t even considered prospects anymore. Blanton was mediocre at his best. Put anyone in his spot with a 4.60 ERA or better and we win that series. He was OK with Oakland and they thought theyd get similar when he came here, and he really never gave them anything close. Never an era under 4.00, no CGs, barely ever got to the 6th, We won it with bats, not with arms other than when Hamels pitched. The 2008 Phillies were scoring runs on most nights like it was easy, Even the home run Blanton hit came in a 10-2 blow out and wasnt needed. Blanton went 4-0 down the stretch with an era that was over 4.00. He had run support and always has had tons of run support. Yet he only wins 9 games outta 28 starts, 12 games out of 31 starts. Put him in a Mets uniform since 2008 until 2011 and NOONE would want him anywhere near our team because HE WOULD BE A METS OUTCAST THAT ISNT GOOD ENOUGH TO BE PHILLIE!! Ya know, Blanton also hurt the Phillies in every playoff start after 2008, Charlie stuck by him and they lost every game, he even let Joe start over Lee, and Halladay and we lost both game 4’s and ended up getting bounced largely because of them 2 games!! 2 games that would have tied the series but instead put us down 3 games to 1!! Noone remembers them games!! And Hamels has 1 bad season where he puts up similar numbers to Blanton, 4.35 ERA, and everyone wants him off the team, when Blanton puts them numbers up, hes on a pedestal. ANyone who watches Blanton pitch, knows he is gonna melt down sooner or later, and of he dont its like WHEW!!! thank God!!! People used to say hes an ace, hes an ace on anyone elses team, LMAO, like the rest of baseball standards arent as high as ours. Everyone else wants an ace that goes 5 inns with a 5.50 era!! Hes lucky hes a 5th starter, and to me should be in the pen, maybe he would put up better numbers, if he could get past that 1st inning, because after 4 innings is when he falls apart. Outta the pen he wont have to pitch that long. Uh . . . I think he helped win us a world series. How soon they forget and, by the way, Outman has been hurt and Cardenas is no longer a top prospect. Exactly. The Blanton deal was a great deal for a contending club to make. He was a big part of our WS victory and he’s consistently a 2 WAR player who gives you 200 IP. Outman has given the A’s maybe 1/2 of a season of good pitching while Cardenas still hasn’t seen an A’s uniform (and he’s been terrible in 2 attempts at AAA now). It was a great trade for the Phillies. 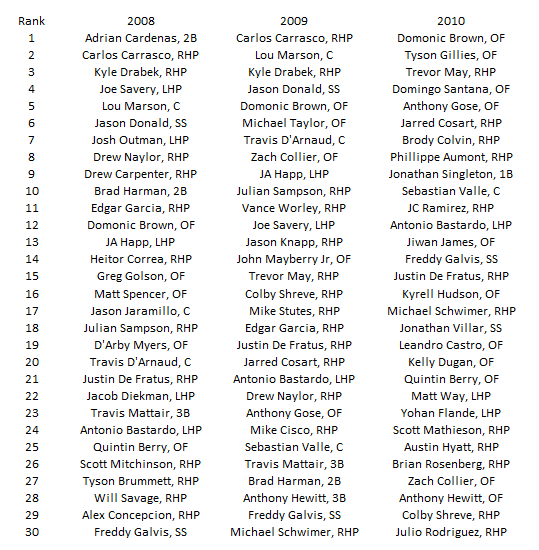 Wow, a grand total of 3 guys from the 08 list will be on my list this year, and I’m guessing that number would be 2 for a lot of posters here since Galvis doesn’t seem that popular at the moment. Gauntlett who i expect hits Clearwater at least by the end of the year. My dark horse is Chace Kekoa Kenji Numata (ya gotta luv it). Make that “whom” for the people with time on their hands.